This chair was provided by the A&EP (Victorian Aids and Equipment Program). It remained their property while on loan to us and was returned to A&EP when no longer required. This chair was provided by the A&EP. It remained their property while on loan to us and was returned to A&EP when no longer required. Patricia had a hospital bed with a hand held control that allowed us to raise or lower the bed electrically and also to raise and lower the headrest section of the bed. The bed was provided by the A&EP. It remained their property while on loan to us and was returned to A&EP when no longer required. Air mattresses allow air to flow continuously through the mattress when switched on. This is to assist in the prevention of bedsores. Patricia initially had an Apex ripple air mattress which was later upgraded to a Quattro air tube mattress. The mattresses were provided by the A&EP. They remained their property while on loan to us and were returned to A&EP when no longer required. I used the home hoist for all transfers, between her armchair and wheelchair, taking her to the bathroom, putting Patricia to bed and getting her out of bed and also when I was turning her in bed. It can also be used for lifting people up off the floor. The hoist was provided by the A&EP. It remained their property while on loan to us and was returned to A&EP when no longer required. This is a small computerised keyboard with two single line plasma screens, one at the front and one at the back. It is made in England by Toby Churchill Ltd and marketed in Australia by ZYGO (http://zygoaustralia NULL.com NULL.au/). The device speaks each word as it is typed and then replays the complete sentence when finished. Certain key phrases are stored in memory and can be recalled by pressing the memory key followed by one other key. The LightWRITER was provided by the Electronic Communication Devices Scheme Division of the A&EP. It remained their property while on loan to us and was returned to them when no longer required. Patricia has a lumbar support for her armchair. This was provided by the A&EP. It remained their property while on loan to us and was returned to A&EP when no longer required. This device is used to help thin out Patricia’s mucus. We purchased it from a local supplier of medical equipment. When Patricia was unable to hold a book in her hands, Uniting Care Community Options loaned her a Gewa Page Turner which was on loan to them from the Motor Neurone Disease Association of Victoria. In time, her manual dexterity deteriorated to the point where she was unable to operate the controls. As Patricia became less mobile, it was necessary to modify her bathroom. We approached the occupational therapist at MonashLink, and she submitted a recommendation to the A&EP to fund part of the cost of modifying the bathroom. The A&EP sent an architect to our house, at their cost, and he designed the modifications to Australian Standards and prepared the relevant drawings. I then obtained three quotes from a list of tradespeople specialising in bathroom extensions for disabled people. The quote selected was for $7,600 and A&EP paid $4,000 which is their maximum. I paid the remainder. 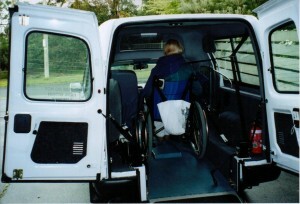 When I found it increasingly more difficult to transfer Patricia from her wheelchair to the front seat of the car and vice versa, I then started to use the special wheelchair taxis. But in time I found them to be completely unreliable, especially for short trips. On several occasions we simply could not get a taxi after waiting for over an hour. So I purchased my own wheelchair vehicle. 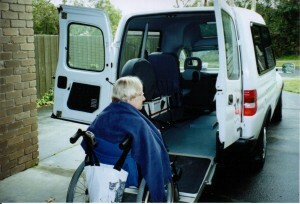 It was a General Motors Holden Combo van which had been modified to Australian standards to take a wheelchair passenger in the back. The modified vehicle was renamed “Quinto”. See below. 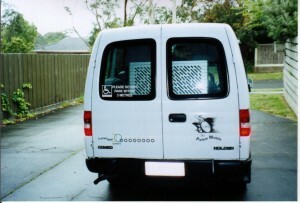 I purchased the modified vehicle from Fleetworks Mobility Pty Ltd, 11 Vickery Street, East Malvern, Victoria 3145. The contact there is David Syer. His telephone number is 61 3 9569 3166 and his fax number is 61 3 9571 0821. Vehicles like this one are not cheap. The cost of converting this vehicle was in the vicinity of A$22,000. We got good use out of the vehicle until about March 2002 when I decided to sell it because Patricia was rarely going out as a result of her deteriorating condition. 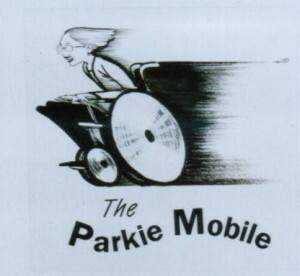 On the rear door and the driver’s and passenger’s doors was a cartoon of Patricia drawn by the cartoonist Geoff Hook. It is hard to see in the photo above, but if you look really hard, you will see his trademark hook to the right of the drawing. For those of you who do not know Geoff Hook, he is one of Australia’s best known cartoonists. Every cartoon that he drew would contain a little hook somewhere in the drawing. Every now and then, he would forget the hook and the switchboard of the newspaper or magazine in which the cartoon appeared would be jammed with people demanding to know where the hook was!